Athens, GA (Aug 22, 2008) - In 1996, as I was walking from the media operations center at the University of Georgia Tate Student Center to the press box of Sanford Stadium, I was approached by an Argentinian futbol fan. As his team was preparing to face Nigeria for the men's gold medal, he wanted to buy my volunteer uniform hat. Of course, as I was required to wear it in the press box, I could not take his cash offer. I could not even accept his increased offer to trade his very, very pretty (ok hot) girlfriend for the hat. Something told me my wife would not have been happy if I had accepted the offer. Photograph Courtesy of the University of Georgia. That day also marked the end of an experience I could only experience once in a lifetime, and only happened as an almost last minute decision on my part. A few months earlier, I was holding my then 18 month old daughter as we watched the Olympic Torch being run down Lumpkin Street in Athens. She had no idea what was going on, but to me, and others gathered on the front lawn of the Catholic Center at UGA, it was something we knew we would see only once in our lifetimes. It was then that I realized that I needed to try and volunteer, but that because I had waited so long, it might not be possible. So I made the phone calls and put my name in the hopper. The prospects were not good. But then I got a call from Claude Felton, the sports information director par excellence at the University of Georgia. He asked me to come see him in his office. As we sat and talked, he offered me to position of "Results Distribution Manager - Print Media for the Soccer Venue". Of course, I jumped on the opportunity. The title was cool, but the job was really mundane. 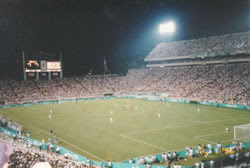 It meant that we gathered results from all of the soccer venues around the United States, copied and collated them, and then had a team of runners immediately distribute the results to the media in the print media press box, the media operations center, and to the "Olympic Family" suite on the far side of Sanford Stadium. Luckily I had a pool of young students, including current Tampa Tribune writer Marc Lancaster, who could deal with the oppresive Georgia heat and humidity of August to make the results runs to the other areas outside of the press box. There were so many intangible and tangible benefits to this volunteer experience. I was able to catch up with then Washing Post, and now USA Today, writer Christine Brennan who I had met when working Washington Redskin games over the years. I was able to take the wife to the dress rehearsal for the opening ceremonies, a ticket we could never have afforded on our own. I got to work with a great group of students and other members of the Athens community. I got see history as the US women won their first Olympic Gold. But by far, the most unique experience was working in an international press box. You see, in the United States, the rules of a working press box are simple: no cheering allowed. The media is there to report on games, not participate as fans. If you cheer in a US Press box, you will be removed. It is as simple as that. For international events, there is no such rule. And for a soccer venue, the atmosphere becomes different. As Nigeria won the gold medal over Argentina, the press box exploded. 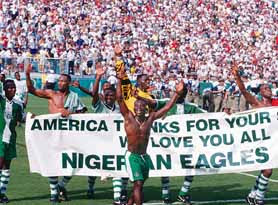 Nigerian reporters lept from their seats, started dancing and hugged anyone within reach. The pure, raw emotion was incredible to watch. There was no myth that they were there as objective journalists. They were there to report the game back to their native country. They were not there as athletes, but they were there to share in their national pride. The hours were long, and the uniforms (including the mandatory swatch watch) could be stifling. But is an experience to be treasured for the rest of my life. So if readers ever get a chance to volunteer for the Olympics, take advantage of it. You will never forget it.